Australian South Sea Islanders were officially recognised as a distinct cultural group by the Queensland Government on 7 September 2000. This followed the Commonwealth Government’s acknowledgement of Australian South Sea Islanders in 1994. Australian South Sea Islanders are descendants of South Sea Islanders who were transported to Australia to work as indentured labour in the in the Queensland Sugar Industry in the late 1800’s. Some 62,000 islanders, mainly from Vanuatu and the Solomon Islands, arrived between 1863 and 1904. In the past, these Islanders were known as Kanakas. Today the community prefer the term South Sea Islanders to describe their ancestors. 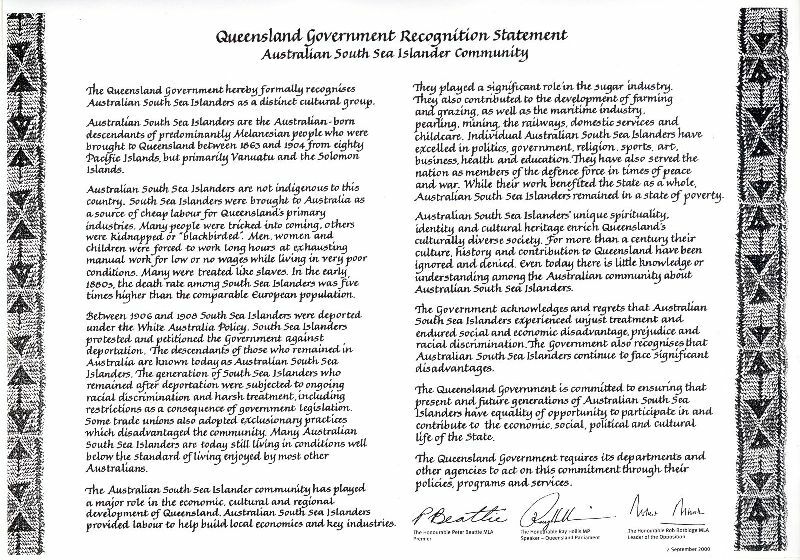 Recognition for Australian South Sea Islanders acknowledges the descendants of the first South Sea Islanders, and recognises the injustices and discrimination the community has suffered for over a century. Australian South Sea Islanders are proud of their heritage. They continue to maintain their identity and links back to their island homelands. Large communities of Australian South Sea Islanders are located along the Queensland coastline and northern New South Wales.